"This is a favorite girl's-night drink for me. We love to mix these up any time of the year but even better on a hot summer day." Place thawed frozen strawberries, amaretto liqueur, vanilla ice cream, vanilla extract, crushed ice, and vanilla vodka into a blender. 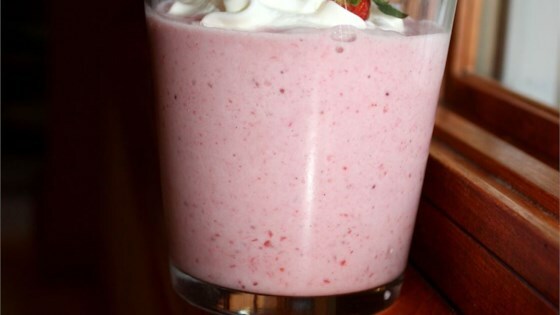 Pour into a glass and garnish with whipped cream and a fresh strawberry. Who doesn't like strawberry shortcake? For our personal tastes we would use just a little less amaretto the next time. This is definitely tasty. I would also add a bit less amaretto. I threw in a dollop of cream cheese frosting in the blender and it made it even tastier. Very good. Tastes just like strawberry shortcake! We left out the vodka and it tasted like dessert.